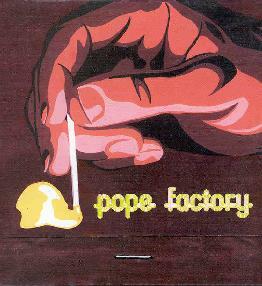 Pope Factory's promo material states that their eye is on Canadian and US college radio and indeed this is evident in their music. But don't let that throw you because there are some extremely cosmic surprises on their self-titled debut CD. From Toronto, the band consists of Scott Warren on guitar and lead vocals, Peter Muha on bass, keyboards, and vocals, Matt Hollingshead on lead guitar and vocals, and Andre Skinner on drums. Four of the album's six tracks fall are along college radio lines, but the band has a knack for melodic pop-psych. "Underrating The Recluse" opens with strumming guitars and a picking melody line. The guitars then launch into a dirtier fuller sound. Pop music with a slight dissonance that I liked. "Channeling Ringo" is similar but really jams out. More on the pop-psychedelic side, similar to Tom Spacey or maybe just a touch of Olivia Tremor Control. Like Underrating The Recluse it has its dissonant moments which the band seems to like. "Sweet Killings" is a bouncy pop-psych instrumental with a bit of a 60's feel. And "Michael's Haircut" is decent pop-psych with a good acidic guitar sound. Now I liked the previous tracks but to be honest I probably would have forgot this disc after the review if that's all there was to them. But with "Smug" things start to take off. The tune opens with that standard slowly picking melody, but has someone commandeered a spaceship? The pick melody is accompanied by loads of intro spaceship bleeps and the tune soon launches into a rockin' full band swing. The wall-of-sound guitars are chunky but not droning as melody is clearly important to these guys. The last minute is killer space-pop as we're still swept away by a melody that leads a molten rumbling space jam. The band's epic, and the tune that made the whole album for me is "The Wait". The song begins with drifting psych guitar lines and spaceship guitars soaring in the background. Subtle but very cosmic. It then launches into a slow but aggressive cosmic crunch with freaked out astral guitars. It was like Ax Genrich was sitting in with them for this tune. The music jams on and despite the cosmic aggression maintains its sense of melody and feeling of floating in space. At ten minutes the music has plenty of time to develop and moves through a number of quieter moments. If the whole album was like this I'd call it a must have for AI readers. Recommended to the pop-psych curious who want to play it safe knowing the melt your face off stuff is there too. You can visit Pope Factory at their web site.